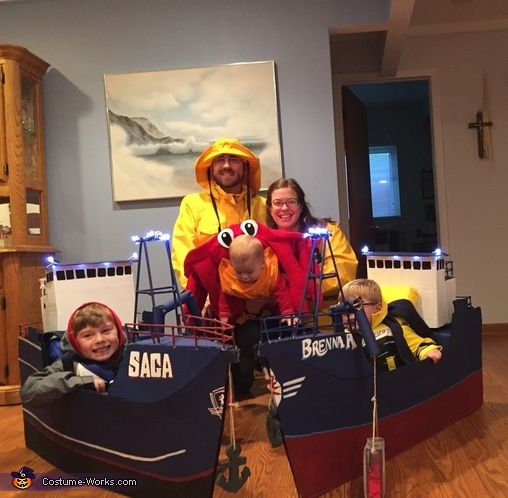 My husband thought I was kidding when we were watching Deadliest Catch and I said we should make our older boys the Brenna A and the Saga, our baby a crab and we could throw on some rain coats and be their crew. Well that was it, he didn’t believe me and to me that translated to challenge accepted. LOL! My husband and I both love the show. The Brenna A is my favorite, because I also lost my dad to ALS, and the Saga is my second favorite captain so that is why we picked the boats we did. I made the boats out of cardboard that I got for free from a local store (they were just going to recycle it anyways). I drew an outline of what I thought the boat look liked and cut it out with a box cutter. I then traced the one I cut out and attached them together with a hinge I made out of another piece of cardboard with gorilla glue and hot glue (the hot glue helped keep the piece in place while the gorilla glue dried...this is how I glued everything that I could not clam with beach towel clips). To get the curve on the back of the boat at the top and the bend for the bow in front I cut through the inside layer of cardboard very lightly so it would not go all the way through, but would give the cardboard that clean bend. I made the crane out of card board tubes I got for free as packaging form an online order, cut slits and drilled holes in the tube, then put a wooden dowel through the two tubes to make a joint that could bend. I put hot glue on the outside of the dowel so it wouldn’t fall out but would work as a functioning joint. I mounted the crane to the boat using two small square pieces of cardboard; I put one on the top that the entire crane was mounted to and one underneath. Before I mounted the crane on the cardboard I drilled a hole in the bottom and put a wooden dowel through it and hot glued the end that would go inside the base of the crane. I also threaded a rope through it and attached the end underneath other a curler so the pot would go up and down. To hold the pot in a high position the boys would clip a hair clip around the curler full of rope then attack it to a piece of cardboard underneath the deck. This is also how the anchor went up and down. I drilled a hole in the deck, put the dowel the crane was attached to through the hole and put another piece of cardboard underneath the deck and capped the other end of the dowel with hot glue so the crane would swivel. There cannot be any gaps between the two pieces of cardboard and the deck. The deck is also cardboard that I cut about 5 inches too wide then did a light cut on both sides so I would have a flap (I only cut one layer) to glue to the inside of the side wall. This is how I should have done the back deck, but I did that first and used pieces of cardboard that acted like hinges so the cardboard hinge stuck to the bottom of the deck and the wall of the boat. To make the Captains area I made two boxes, one tall and skinny and the other shorter for the back deck. The rails and light stand are all wooden dowels that I cut up with a tree/bush trimmer and put together. My sons helped me paint the rails, light posts and anchors. The crab pots are also made of wooden dowels hot glued together and covered in a tool with wider holes. I filled the pots with scraps from the crab costume. I painted the boats with acrylic paint and free handed the details. The lights are small strands of wire twinkle lights that I wrapped up get the looks I wanted. The crab is hand sewn molded after one of my boys stuffed animals. The shell and legs are stuffed with stuffing from and old pillow. I hot glued the felt on the eyes together and hot glued them to the shell. I used elastic to get that slight definition on the belly of the crab and used Velcro to connect the belly to the shell. The three costumes together probably cost me $40 and most of that was the acrylic paint, brushes (painting was new for me...not an artist by any means), lights and red felt. Isaac (5) is the Saga, JJ (3) is the Brenna A and Matthew (11 months) is the crab.